صبحی قراملکی, ناصر, پورعبدل, سعید, عباسی, مسلم, بیگان, محمد جواد, نبی دوست, علیرضا. (1394). اثربخشی آموزش طرحواره درمانی به شیوه گروهی بر تعدیل طرحوار ههای ناسازگار اولیه دانش آموزان مورد آزار. 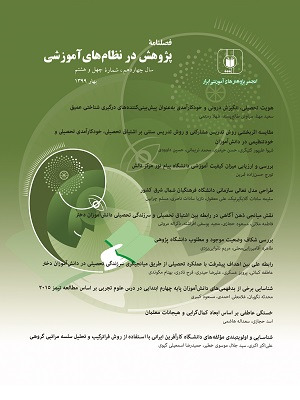 نشریه پژوهش در نظام های آموزشی, 9(28), 7-30. ناصر صبحی قراملکی; سعید پورعبدل; مسلم عباسی; محمد جواد بیگان; علیرضا نبی دوست. "اثربخشی آموزش طرحواره درمانی به شیوه گروهی بر تعدیل طرحوار ههای ناسازگار اولیه دانش آموزان مورد آزار". نشریه پژوهش در نظام های آموزشی, 9, 28, 1394, 7-30. صبحی قراملکی, ناصر, پورعبدل, سعید, عباسی, مسلم, بیگان, محمد جواد, نبی دوست, علیرضا. (1394). 'اثربخشی آموزش طرحواره درمانی به شیوه گروهی بر تعدیل طرحوار ههای ناسازگار اولیه دانش آموزان مورد آزار', نشریه پژوهش در نظام های آموزشی, 9(28), pp. 7-30. صبحی قراملکی, ناصر, پورعبدل, سعید, عباسی, مسلم, بیگان, محمد جواد, نبی دوست, علیرضا. اثربخشی آموزش طرحواره درمانی به شیوه گروهی بر تعدیل طرحوار ههای ناسازگار اولیه دانش آموزان مورد آزار. نشریه پژوهش در نظام های آموزشی, 1394; 9(28): 7-30. خوشه ای چندمرحله ای انتخاب و به صورت تصادفی در دو گروه آزمایش و کنترل ) 20 نفر برای هر گروه( گمارده شدند. منفی و جلوگیری از شک لگیری طرحواره های ناسازگار در دانش آموزان مورد آزار موردتوجه قرار گیرد. برازنده، هدی لقا (1384). بررسی ارتباطی و طرحواره های ناسازگار اولیه با سازگاری زناشویی .پایان نامه کارشناسی ارشد روانشناسی بالینی، دانشگاه فردوسی مشهد. دیده روشنی سونیا (1389). بررسی ارتباط طرحواره های ناسازگار اولیه با نشانه های بیماران افسرده و مضطرب، پایاننامه کارشناسی ارشد، اردبیل، دانشگاه آزاد اسلامی واحد اردبیل. راهب، غنچه؛ اقلیما، مصطفایی، کمرودی، عباس و کفشگر، مجتبی (1388). تأثیر روانی اجتماعی کودک آزاری و نقش پلیس در پیشگیری از بروز آن. فصلنامۀ علمی- اجتماعی، سال اول، شماره دوم، تابستان 1388، ص 86-106. شهامت، فاطمه؛ ثابتی، علیرضا؛ رضوانی، سمانه. (1389). بررسی سبک های فرزند پروری و طرحواره های ناسازگار اولیه. مطالعات تربیتی و روان شناسی ،11(2)، 254-239. کاهانی، علیرضا (1383). بررسی عوامل درون مدرسه ای و برون مدرسه ای مؤثر بر رفتارهای پرخطر دانش آموزان دوره متوسطه نظری و مهارتی استان بوشهر. آموزش وپرورش استان بوشهر. محمدخانی، پروانه، محمودی، علیرضا، احمدی، حسین و جمشیدی، رضا (2003). تهیه و اعتبار یابی پرسشنامه کودک آزاری. پایان نامه کارشناسی ارشد. نوری تیرتاشی، ابراهیم و کاظمی، نرجس (1391). بررسی تأثیر روایت درمانی بر میزان تمایل به بخشودگی در زنان. مجله روانشناسی بالینی ،4 )2(، 78-71. یانگ، جفری (1384). شناخت درمانی اختلالت شخصیت، رویکرد طرحواره درمانی. ترجمه علی صاحبی و حسن حمید پور. تهران انتشارات آگه. Alden, L. E.,& Taylor, C. T. (2004). Interpersonal processes in social phobia. Clinical Psychology Review, 24 (6): 857-882. Amato, P. R.,& Ochiltree, G. (1986). Family resources and child competence. Journal of Marriage and Family, 48 (12), 47-5. Baker, E., & Beech, A. R. (2004).Dissociation and variability of adult attachment dimensions and early maladaptiveschemas in sexual and violent offenders. Journal of Interpersonal Violence, 19, 1119-1136. Ball, J:Mitchell, P. malhi.G, Skillecorem, A & smith, M(2012) schema focused therapy For borderline disorder: reducing vulnerability to relapse through attitudinal change. Australian & new zealand journal of psychiatry 37(1),41. Carmody James, Baer Ruth A. (2008) Relationships between Mindfulness Practice and Levels of Mindfulness, Medical and Psychological Symptoms and Well-Being in a Mindfulness- Based Stress Reduction Program. Journal of Behavioral Medicine. 31(9): 23-33. Chapman DP, Whitfield CL, Felitti VJ et al. (2004). Adverse childhood experiences and the risk of depressive disorders in adulthood. Journal of Affect Disorders, 82 (9), 217–225. Currie, J. & Widom, C. S. (2010).Long-Term Consequences of Child Abuse and Neglect on Adult Economic Well-Being. Child Maltreatreatment, 15(3): 111-120. Eisenberg, N., & Fabes, R. A. (1998).Socialization and mothers' and adolescents' empathy-related cha- racteristics. Journal of Research on Adolescence, 3(2), 171-191. Galenson, D. (2003). Portraits of the Artist: Personal Visual Art in the Twentieth Century. University of Chicago - Department of Economics; National Bureau of Economic Research. Gilbert, P., Procter, she. (2006). Compassionate Mind Training for people with High shame and self-criticism. (PDF) Clinical Psychology and Psychotherapy. Psychother. 13(5), 335-379. Harris AE, Curtin L. (2013). Parental perceptions, early maladaptive schemas, and depressive symptoms in young adults. cognitive therapy and research. 26: 405 - 416. Helesen, M., Vollebergh, W.,& Meeus, W. (2003). Social support from parents and friends and emotional problems in adolescence. Journal of Youth and Adolescence, 29(3), 319-335. Hildyard, K. L. & Wolfe, D. A. (2002).Child neglect: Developmental issues and outcomes. Child-abuse & Neglect 26 (6), 679-695. Hoffort, A: Vesrland, S. & Sexton, H. (2002).Self understanding,guided discovery and schema beliefs in schema focused cognitive therapy of personality problems: A process outcome study. Journal of cognitive therapy and research.26(2),190 219. Horton E.Crues.g (2010). "Culture and child maltreatment: cultural competence and beyond, child abuse and neglects", PP: 637-644. Jacquin, K. M. (1997). The effects of maladaptive schemata on information processing.Unpublished doctoral dissertation.The University of Texas at Austin. Mash, E. & Wolfe, D. (1999).Abnormal child psychology. International Thomson Publishing Company. Morrison, Norma. (2011).Schema Focused therapy for comlex long standing problem:A single case study. Behavioral and cognitive psychotherapy.28(3),269 283. National Clearinghouse on Child-abuse and Neglect information (2004) Longterm consequences of child-abuse and neglect.Available in www.nccanch. hhs. gov. Pollack, S. D., Cicchetti, D., Hornung, K., & Reed, A. (2010). Child victimization: Maltreatment, bullying and dating violence. Available at: www.google.com. Reed, A. (1999). Child victimization: Maltreatment, bullying and dating violence. Sadock, B. J., Kaplan, H., & Sadock, V. A. (2007). Synopsis of psychiatry: Behavioral science clinical psychiatry. Philadelphia: Lippincott, William and Wilkins. Segrin, C.,& Taylor, M. (2007). Positive interpersonal relationship mediates the association between social- skills and psychological well being. Personality and Individual Differences, 43 (8): 637-646. Seligman MEP, Schulman P, Tryon A. Group prevention of depression and anxiety symptoms. Behavior Research & Therapy. 2007; 45(6): 1111-1126. Soygut G, Karaos manoglu AC. (2013). Assessment of Early Maladaptive schemas: A Psychometric study of the Turkish Young schema Questionnaireshort form-3. Turkish Journal of psychiatry. 13(3): 112-122. Switzer, I. (2006). Early maladaptive schemas predic riskly sexual behaviors. Unpublished thesis masters. Mississippi State University. Ward, T., & Beech, A. (2006).An integrated theory of sexual offending. Aggression and Violent Behavior, 11, 44-63. Ward, T., Keenan, T., & Hudson, S. M. (2000). understanding cognitive, affective and intimacy deficits in sexual offenders: A developmental perspective. Aggression and Violent Behavior, 5, 41-62. Ward, T., Polaschek, D. L. L., & Beech, A. R. (2006). Theories of sexual offending. England: Leicestershire.Wiley. Welburn K, Corstin M, Dagg P, Pontefract A, Jordan SH. (2002). the schema Questionnaire–short form: Factor analysis and relationship Between schemas and symptoms. cognitive therapy and research. 26(4): 519-530. White C. (2011). Childhood maltreatment is linked to recurrent depression. BMJ. 16(3): 343-357. World Health Organization (WHO) and International Society for Prevention of Child Abuse and Neglect (ISPCAN). (2006). Preventing child maltreatment: a guide to taking action and generating evidence. Available from http:// whqlibdoc.who.int/publications /2006/9241594365eng.pdf. Young JE. (2005). Young Schema Questionnaire Short Form. New York: Schema Therapy Institute. Young, J. E., Klosko, J. S., & Weishaar, M. E. (2003). Schema therapy: A practitioner’s guide. New York: Guilford Publication.